Good luck on Celebrity Apprentice Aubrey O'Day! known for her works: "Celebrity Apprentice," "All About Aubrey," "Confessions of a Teenage Drama Queen," "Hairspray" and more! 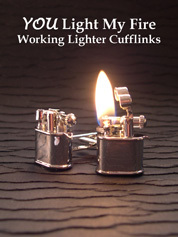 seen with YOU gNeek's Working Lighter Cufflinks and says, "Soo much fun!!" Note: YOU gNeek neither states nor implies that any of these celebrities endorse our products. We sincerely thank Aubrey O'Day for taking pictures with our functional jewelry!